Port Augusta is the usual starting point for many of our outback trips but on a whim we called in to look around Port Pirie. What a lovely town! We will be calling again. The first stop was the information centre. They have a daily tour of the town at noon but you need to book early in the day (or even the day before). By the time we arrived they had cancelled the bus as there were no other bookings. Instead we spent some time visiting Shakka The Shark. This has got to be the best value $3pp entry fee in South Australia. We had a one hour private tour with a lovely lady of more ‘senior’ years, resplendent in knitted cardigan and whose name escapes me but it was something like Gladys or Ivy. She was the font of all knowledge and her stories were fascinating. Here is some of Shakka’s story. Shakka is a replica of the longest Great White Pointer ever landed in South Australia. The shark was accidentally drowned in 1998 when it became entangled in a local fisherman’s snapper line. Primary Industries Officers and locals helped bring the massive 5.5 metre shark to shore where it was beached at the Port Pirie boat ramp and transported to Adelaide by road where it was stored in a giant freezer until members of the South Australian Research and Development Institute (SARDI) could conduct a scientific dissection. In exchange SARDI provided the Port Pirie community with a life-sized replica made from an original cast and including all the battle scars, deformed teeth and identifying marks. 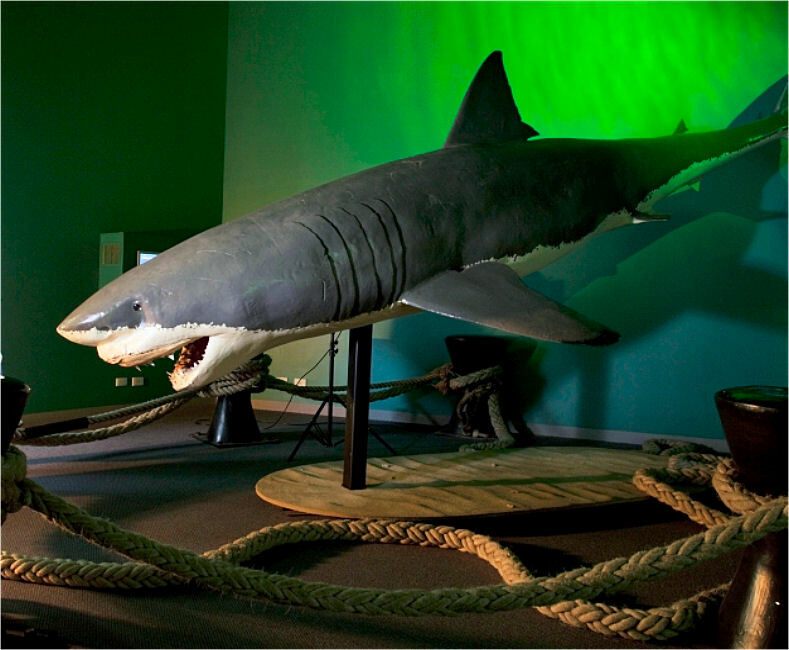 The original jaws, preserved pectoral fin, parasites and 400 photographs were also donated back to the Port Pirie community. The exhibition is showcased in the Port Pirie Regional Tourism and Arts Centre and is a must see. Just look for Gladys…or Ivy – I’m sure you will know her when you see her. Photo from Port Pirie Tourism material. The second and no less impressive place we looked at was the RSL museum. It was the sign on the highway that read ‘Visit Port Pirie RSL Museum – home of South Australia’s only RAAF Iroquois helicopter’ that had convinced us to turn off the highway. The museum itself is designed to give the impression that you are in a hangar. I’d always wondered why they were called Huey’s when it is officially a Bell Iroquois. Most Bell helicopters are named after American Indian Tribes. Fortunately logic prevailed and it soon became obvious that Iroquois is too hard to say so the UH1 model number was used – and soon shortened to Huey. 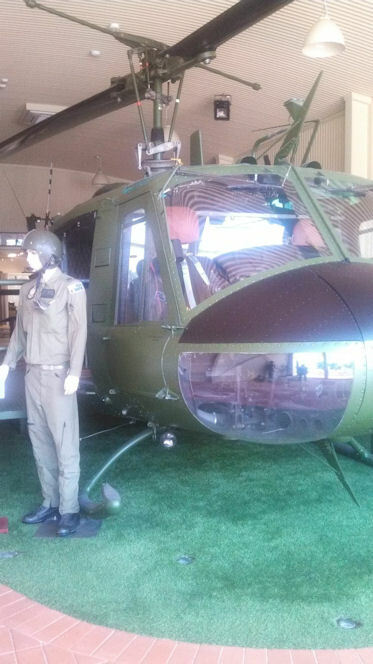 The Huey at Port Pirie RSL is a UH1-1H model designed to carry 14 troops or 6 stretchers or equivalent cargo. The best part about this display is that you can touch it and sit in it. The PortPirie RSL Museum displays exhibits from the Boer War to present day Afghanistan, including Australian peacekeeping missions. The museum has two Multi Media information points that allow visitors easy access to film footage, slides, photos and audio of the different wars – often from the soldier’s viewpoint. Unique displays include the kit bag of the soldier given the first regimental number in the Australian Imperial Forces, dead Man’s Penny sent to the relatives of fallen soldiers, a rare and unusual German Woven Paper Work Coat, a metal photo frame made from a dixie by a Japanese prisoner of war, the engraving achieved from a nail sharpened on a piece on concrete, diaries and personal relics from “Rats of Tobruk” soldiers, postcards and native garments from Somalia, limited edition statue and story of Horrie the Wog Dog – a four legged War Hero, medals, badges, trench art and original uniforms are always on display. 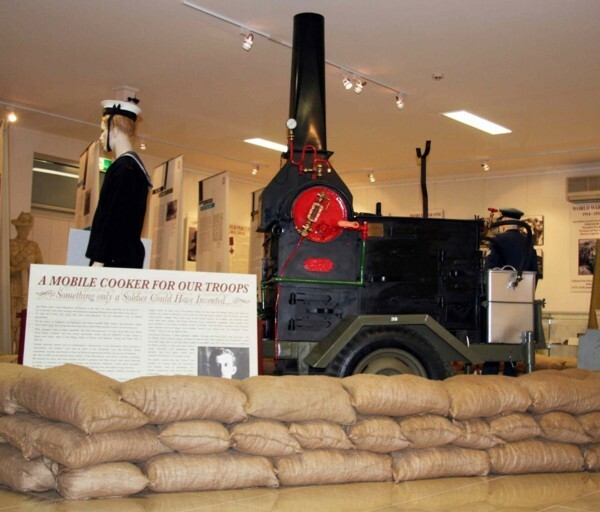 An important part of the museum and Port Pirie’s History is the exhibit detailing the History of Number 2 Bombing and Gunnery School R.A.A.F in Port Pirie during World War 11. No 2 B.A.G. was opened in June 1941 and by November 1943, 3,500 airmen had passed through the school. Many of the RAAF crews who flew from Britain across Europe in Lancaster and Mosquito aircraft trained in Port Pirie. As individual displays within the museum change regularly, return visits are recommended. Of interest is the fully restored to working condition the Wiles Junior Mobile Cooker. Mobile cookers like this played a significant role in our war effort. A picnic on the foreshore wrapped up the visit to this lovely but often bypassed town. It won’t be our last visit.